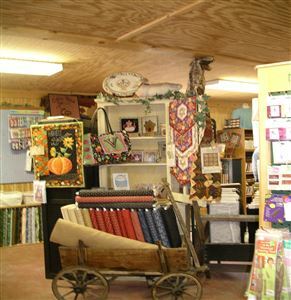 Calico Patch Quilt Shop is home to Calico Patch Designs where the past graces the present with a rustic display of fabrics. 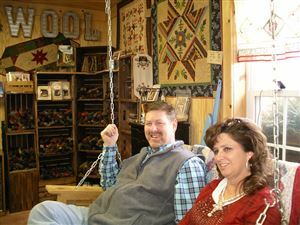 Sitting on the porch swing hung inside their shop, a Mother’s Day gift, Vicki and Tom McCarty glide back and forth surrounded by cottons, homespun and wool fabrics. As the sunshine came through the window, our eyes were delighted with the colorful array of patchwork quilts. community education. 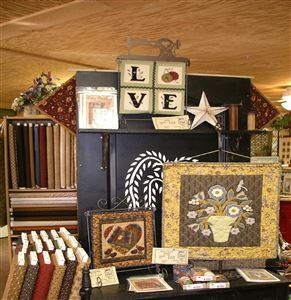 She had such a local following she decided to close her successful photography studio and open Calico Patch Quilt Shop. About this time, Tom was called up by the National Guard where he spent a year at Fort Bragg. During the time apart, Vicki went to technical training to repair BERNINA sewing machines. As things began to fall into place, their little fabric shop was created. They felt that if they could make it through the first two years they would make it a success. The third year they paid back their initial investment. In those first years, “Family Night” was a collaborative effort with Vicki, Tom and their two boys stapling, folding, and stuffing envelopes. Although their boys are now grown, the business continues with their hands on approach with their employees folding patterns. As we sat and visited, there was a team of ladies folding and stuffing patterns. “We have and automated department! That’s Mom, Lauri, Nola and Judy, they automatically do whatever needs to be done. We are high tech,” Vicki says laughingly. One of Vicki’s favorite patterns creation is called “Nellies Tree Skirt” which is still available today. She pointed to it along with several pieces that are near and dear to her heart, a five inch charm square quilt and a Christmas Tree Braid using a jelly roll. In the last two years, Calico Patch has a created a pattern line consisting of over fifty patterns now in the marketplace. Vicki gives Tom credit for the clear and concise instructions to the patterns that allows any quilter to read and understand. Tom gives credit to his time in the military for taking large amounts of information and making it into clear instructions. As many couples learn their spouses thought process, Tom has learned to interpret the finishing process in the patterns. Their very professional looking patterns are printed locally by Good Shepherd Printing in Morehead, Kentucky. Each pattern published has a passage from the Bible. Just the two of them together setup and welcome people to their booth at many national level quilt shows across the eastern United States throughout the year. Last year their schedule was pretty busy traveling to ten shows. Recently, to make things more enjoyable, they purchased a camper to pull along to the events which comes along with an added adventure. Vicki was quick to point out that Tom is the muscle of the team. Early on, he would try to help in setting up their booth with placing decorations only to have Vicki move it somewhere else. So he accepts being the muscle of the team by carrying in the boxes and lets Vicki do the decorating with her charming appeal. “Tom, a retired State Trooper, is not just muscle. He went from the long arm of the law to the long arm quilting machine”, says Vicki. Tom does all of the long arm quilting on the quilts that come through their shop. On Vicki’s designs, she has specific ideas as what she wants quilted and Tom will find and make patterns to match. Not many men are involved in a woman’s world, but Tom is a hands on guy by taking care of the heavy lifting and creating designs on the long arm quilter for their customers. He is also the certified BERNINA technician and services sewing machines that are brought in for repair. 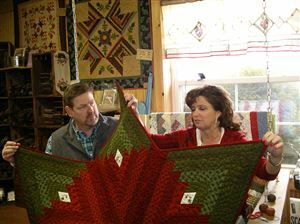 Along with the trade show, Vicki and Tom are not too busy to host several quilting retreats at Carter Caves State Park, in Olive Hill, Kentucky about 35 minutes east of Morehead. At first, there was one retreat where locals came for sewing. However, the word was out about a great time of sitting and sewing at the local park that many others wanted to come. They currently host two spring retreats and two fall retreats at the park. Many spouses come along with their wives and stay in the cabins or lodge. The men enjoy the fishing, hiking, and cave tours that the park offers while the ladies enjoy their sewing. Last November 2016, their travels took them to Houston Texas for the “International Quilt Market and Quilt Festival”. It was very exciting meeting so many of the manufacturer’s representatives at the event. That is where they were approached by Nancy’s Notions’. Since the show, Nancy’s Notions has picked up some of Vicki’s patterns. Their spring catalog will feature her pattern for last summer’s Row By Row. They also met the marketing director of Marcus Brothers Fabrics who asked Vicki to create original designs from their new lines of fabric and wools. With Calico Patch Designs’ continued success, Vicki’s work will be featured in the upcoming July edition of American Quilter Magazine for the first time. The couple is humbled by all of this national attention. Vicki and Tom’s favorite part of their business is that customers quickly become their good friends! Vicki enjoys sitting and sewing with those who come into the shop. Many are greeted with hugs. They also acknowledge their team that works day to day with them. They help by testing Vicki’s patterns and Vicki’s mom, Vera, hand sews on quilt bindings.